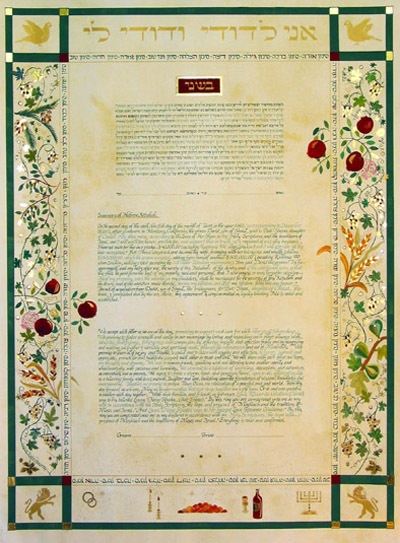 This special Ketubah texts is written in three parts. The first part is Sephardi Orthodox text in Hebrew letters, the second is an English translation of the text, and the third part is an English explanation of the text. The text is written with three shades of olive green matching the green frame on the "parchment " background. The inner frame has blessings for the couple in Hebrew alphabetical order in green and gold paint. On both sides are the Seven Species with which the Land of Israel was blessed. In between the fruits are an abundance of Shell Gold and Gold Leaf details. At the two top corners are Doves of Peace, and at the bottom corners are the Lions of Judea a symbol of Strength. The top frame has the Hebrew quotation from "Song of Songs": "Ani LeDodi VeDodi Li"-"I am my beloved's and my beloved is mine". At the bottom are symbols of Jewish life, the Menorah, Kiddush wine, Challa, Shabbat candles and the marriage rings which are intertwined as a sign of Unity and Eternity.